It's a beautiful holiday to honor our amazing mothers. But I think for so many people, there must be a tinge of sadness attached to this day of celebration. I spent today thinking about Nolan. The baby boy who made me a mother. I only knew him for the shortest time, but it changed me more than any experience of my life. Whenever hard times are looming, Dan tells me he knows we can get through anything because we've already gotten through something harder. I spent today thinking about Mae. The baby girl who made me a mommy. I'm watching her drift off to sleep in her crib as she daintily counts her fingers and twiddles her pacifier. Now her hands are still and her little body rises and falls rhythmically as tiny snores reach my ears. Just a few seconds next to her before I go to bed is enough to wash away all the stresses from my day. I've never felt such peace. I spent the day thinking about Eileen... the woman responsible for raising the guy I love more than anything. She is around babies all day for her job, so I love to hear her reassure me that Mae is smart and beautiful and healthy since I'm sure it's a purely objective professional opinion not clouded at all by grandmotherly love. Also, Mae loves cuddling her more than anyone in the world, including me. But mostly, I spent today thinking about my own mom. She is one of only two people in this world who can comfort me when I turn into a puddle of tears. She is my rush hour entertainment and makes time for me multiple times a week so we can chat while I drive home. She listens to hours of stories about Mae and helps me relive the cute moments and survive the not-so-cute ones. We found out over Easter weekend this year that, after 13 years cancer-free, my mom has breast cancer again. Since then, she's undergone scans and biopsies and tests and procedures, but she stays positive through it all. She even comforts me when I'm having a hard time dealing. I laughed through my tears last week, telling her, "You're not supposed to be the one comforting me." But, that's just who she is... strong through everything. 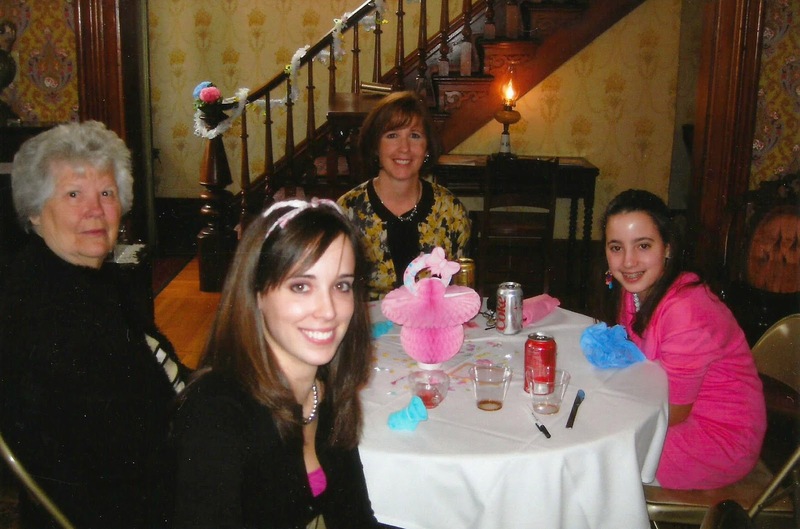 I'll finish with an excerpt of a reflection my mom sent last week, along with a photo of Kelsey and me, our mom, and her mom from almost 10 years ago. "Do not long for the absence of problems in your life. That is an unrealistic goal, since in this world you will have trouble. You have an eternity of problem-free living reserved for you in heaven." Dear Caitlin, I am deeply sorry for your mom. I promise to send prayers her way over the Atlantic. I live right by Lourdes and will entrust her to Our Lady. God bless you all. Thank you, Helene! We truly appreciate your prayers. I feel a special connection to Lourdes, since I spent many evenings praying at the Grotto at the University of Notre Dame, which is modeled after Lourdes.